There are at least two critical challenges to tackle when focussing on solid waste disposal – viz. behaviour and incentives. Both are inextricably interlinked and we need to understand them to be more effective in mobilising ourselves on this issue. Pioneering environmental economist Emeritus Professor David Pearce OBE highlighted environmental issues as being ‘underpriced.’ Price signals in the market are incorrect and do not account for vital environmental services that have great value, which contributes to ‘market failure’ or inability of the market to allocate resources efficiently, resulting in a loss of social welfare. According to Pearce, sustainability means that each generation passes on at least as much capital as it inherited. This includes natural capital – i.e. the stock and state of natural resources. He noted that solid waste posed several major problems for developing countries such as health hazards from uncollected waste, as well as collected but poorly disposed of waste and the economic burden of waste disposal on urban centres. All these imply substantial economic costs to society – e.g. the health costs of dengue to patients, caregivers, employers and the healthcare system. Pearce advocated for any national waste management policy to include four elements: waste reduction at the source – household, office, factory etc. – to a point where the benefits of extra source reduction equals its costs (this acknowledges that source reduction implies costs that need minding); an optimal balance of composting, landfill, incineration and recycling (this means avoiding recycling that uses up more resources than it saves); managing uncollected waste; and a choice of regulatory measures to ensure waste reduction and optimal disposal. 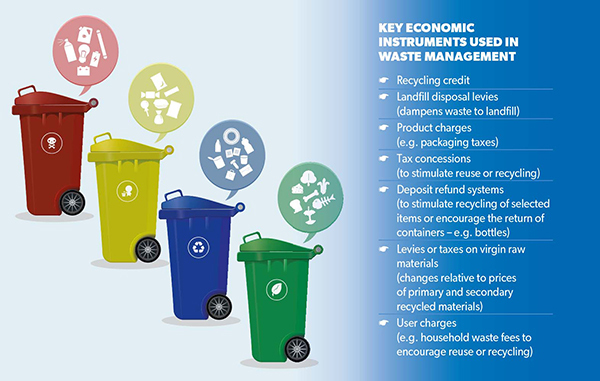 Economic instruments have long been used in developed countries to tackle solid waste but never in isolation. Therefore, they need to be set within an understanding of the context, institutional framework and extent of market failure. Developing countries have high proportions of uncollected solid waste because of affordability. Furthermore, waste is often disposed of informally or in open dumping and collection is usually carried out by the informal sector, which is a major provider of ‘green jobs’ such as scavengers that should not be discounted in formulating policy and interventions. These instruments can raise finance and/or provide incentives for specific environmentally-friendly behaviour (e.g. reuse or recycling) that provides a continuous signal for waste generators to seek least cost combinations of disposal, recycling and reuse. Revenue raising fees are somewhat harder to implement in developing countries given the lack of facilities, infrastructure and strong transparent institutions that will utilise revenues for environmental aims. can improve environmentally-friendly practices of those around us and those we seek to influence. First, there is distortion bias whereby we’re more likely to recycle items that have not been distorted (e.g. undented cans and whole pieces of paper). This may partly explain why many recyclables end up in landfills. And it implies that innovation is needed by sustainability minded companies in packaging that’s easy to open without distorting the product. This aids the likelihood of items being recycled and reused. Second, there are items with which we identify (the identity bias) that make us more likely to recycle them (e.g. cups with our or our school’s name on them). Companies can link a product or service to an identity to improve its product recycling rates (e.g. drink bottles with names of schools). of knowing you will recycle is greater than restraining emotions such as guilt, which make you use less. We need to be aware of our tendency towards ‘moral licensing’! Impact investing – investing for financial as well as environmental and social returns – needs to transcend market limitations, and target solid waste and other issues that small businesses can solve in Asia. Rather than contributing to healthcare and education, why not give to providing solutions for challenges that affect our health and also create sustainable businesses? and incentives means that homegrown solutions will be more effective in creating the right incentives to achieve proper results. Waste draws a picture in our mind, as being collected by authorities in urban and suburban areas while in rural areas – as being dumped in households. Accordingly, either funds or resources have been earmarked or habitually dumped for waste disposal. People are oblivious and blind to the gravity of the waste disposal issue, unless they are directly hit by health and environmental hazards. This issue requires focussing on the solution and following a work-back approach to identify and implement measures that are worthwhile and meaningful. The logic behind this is that, so far we have seen many regulatory authorities stating that they carry out garbage collections and public awareness – an open-ended forward looking approach with no clear objective. Moreover, the current approach seems to be much closer to the starting point of a workable action plan rather than the end point. The waste disposal issue is still at the primitive stage and has become a ‘dirty opportunity’ for a selfish few who want to make a quick gain. In the end, it is an unaccomplished mission and the public lose. Remarkably, some organisations have walked the talk on ‘going green’ and promoting environmentally friendly concepts by facilitating biodegradable packaging, recycling and so on while encouraging their customers to reuse as well. Some have waste treatment plants. Some have modified product packaging to the optimum, thereby minimizing the components that will need to be disposed. There is a long way to go and much more to do, perhaps with the behavioural aspects. Why not reduce waste ourselves at our places? Credo to the core with ‘moral licensing’ and the feel-good effect.